Pelican Brewing new quarterly barrel aging program. Includes Captain of the Coast, Queen of Hearts, Mother of All Storms, and Father of All Tsunamis released quarterly in 22 oz. bottles. Pacific City, Oregon (October 26, 2016)—Pelican Brewing Company crafted a sensation when it released Mother of All Storms bourbon barrel-aged barleywine in 2009 (originally called The Perfect Storm). It soon became a highly-coveted collectable and has been named one of the Top 100 Beers in the World and Top 25 Barrel-Aged Beers numerous times. Now with a nod to the popularity of ‘Mother’ and a vision for creating new recipes that combine beer, spirit and barrel flavors, Pelican launches a quarterly barrel-aged series. The first up in Pelican’s new collection is Captain of the Coast, a Scottish-style Wee Heavy ale aged in Washington Wheat Whiskey barrels and available now in 22 oz. bottles. 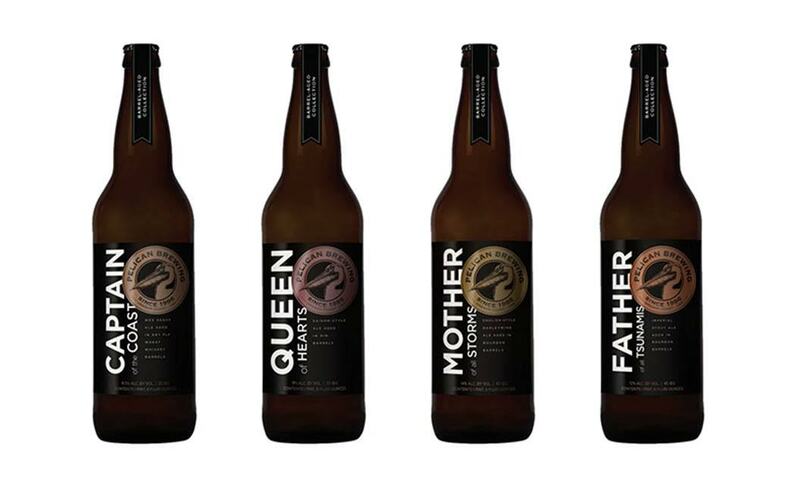 Next, the 2016 vintage of Mother of All Storms is scheduled for release in November, and new Pelican specialties coming in 2017 include Father of All Tsunamis, an imperial version of Tsunami Stout aged in whiskey barrels and Queen of Hearts, a saison aged in gin barrels. Captain of the Coast represents a commanding version of MacPelican’s Wee Heavy. Pelican brewers took the award-winning Wee Heavy and laid it down in Washington Wheat Whiskey barrels from Dry Fly Distilling in Spokane. What emerged was recognizably Wee Heavy, but with added notes of chocolate-covered cherries, toasted oak, spice and vanilla in the aroma. The first sip produces flavors reminiscent of malted milk balls and crème brûlée with a silky smooth mouth-feel. Continue on your bottle voyage and you’ll find dried apricots, sherry-like flavors, and dark marmalade. Captain is brewed with a delicious combination of Golden Promise malt, light and dark crystal malts, flaked barley, Willamette hops, Magnum hops, pure local water and pure ale yeast. Image of Pelican Brewing in Pacific City, Oregon provided by the brewery. Pelican also releases its 2016 vintage of Mother of All Storms next month with a Mothers’ Day Brewers’ Dinner celebration at the Pacific City brewpub on Saturday, November 19, 2016. Mother of All Storms Dinner guests will be the first to taste the coveted bourbon barrel-aged barleywine and eligible to purchase up to a case of this limited production elixir. For reservations, call 503.965.3674. As Pelican beer drinkers know there are many storms out there—all of them perfect in their own way—but there is only one Mother of All Storms and it only happens on the Oregon Coast. Based on Pelican Stormwatcher’s Winterfest English-style barleywine, Mother of All Storms spends a year aging in Kentucky bourbon barrels. At its peak for beer drinkers in November, Mother of All Storms delivers deep flavors of toasted malt, bourbon and oak. The finish rewards with whispers of vanilla, toffee and caramel— best enjoyed with winds in excess of 60mph.